Quit goofing around on the internet. 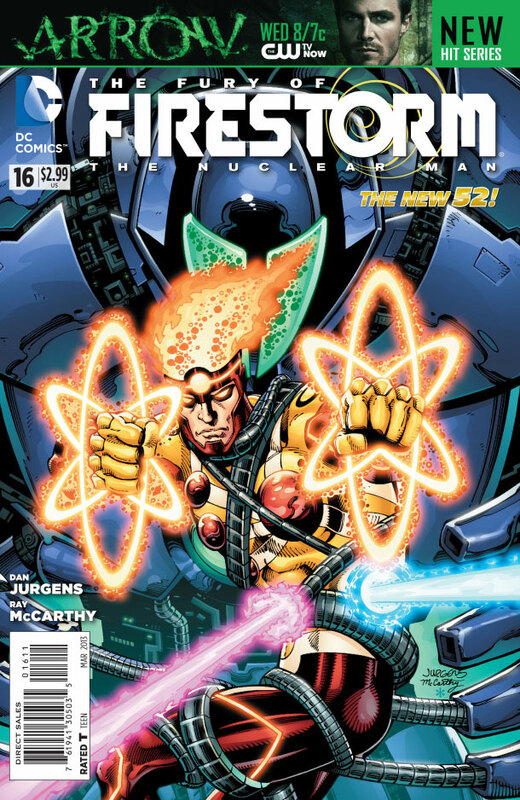 Go read The Fury of Firestorm: The Nuclear Man #16 in stores today! This issue features story and pencils by Dan Jurgens, inks by Karl Kesel & Ray McCarthy, colors by Hi-Fi, and lettering by Travis Lanham! The story picks up right after last issue’s cliffhanger ending! Be sure to buy a copy today and tell your friends to also! Let’s get out there and show our support! 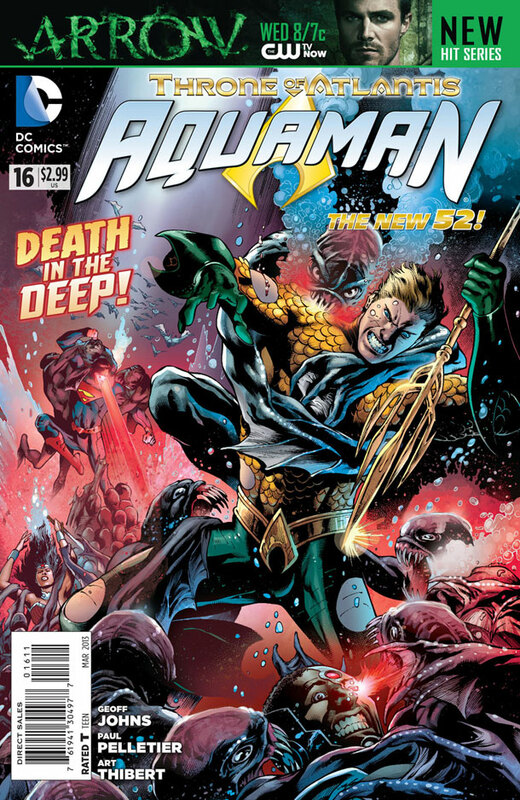 While you’re at the comic shop grab a copy of Aquaman #16, part of the “Throne of Atlantis” storyline. This issue is continued from Justice League #16, and all us Match-heads know what happened on the last page of that comic! I can’t promise Firestorm will make an appearance in Aquaman #16, but it’s worth checking out and it’s been a great story so far! Be sure to pick up a copy and tell your friends to also! Let’s get out there and show our support! We’ll talk later. There’s lots to discuss. Leave your comments here! Posted in: Comic books, Dan Jurgens, Firestorm #10: New 52 v2 (Ronnie/Jason), Firestorm comic vol. IV, Justice League of America. Confirmed! Firestorm does appear in AQUAMAN #16! Clearly they needed to bring in the big guns like Firestorm to boost Aquaman’s sales! The interaction between Jason and Ronnie is wonderful. This is what the book should be all about. It would appear that Firestorm’s first appearance in action as a member of the Justice League in the new 52 universe…takes place in Aquaman. It seems that Jurgen’s has tapped into a Conway-esk writing style for the character, which is when the character is so great. I wonder if Jurgen’s has gone back a read that first run to get inspiration for the character. I’m liking what he is doing far better than what we being done and I hope it continues to improve. I want this character to develop into the total power house that he is capable of being. This issue was by far and away the closest any post-1990 representation of Firestorm has come to Conway’s original. The football game was something right out of the Conway-Broderick era. All it needed was Cliff Carmichael jeering in the stands. I just wish comics were longer these days. This issue was so quick paced that it felt like it was over as soon as it started. I notice they keep reminding us about how Ronnie had Tonya ghost-write his paper, which tells me that there are probably some consequences coming his way. Good! Half the fun of any superhero comic is to see what drama surrounds the alter ego, not just the hero in action himself. I feel like modern-day superhero comics forget that and don’t spend enough time with developing the characters of the alter egos and putting them in ordinary human drama situations. The only thing is that with that said, I’d like to see some drama in Jason’s life too. He should be half the book. I still think it would be interesting to let Jason drive some. I realize that doing so might make Ronnie superfluous as the adviser, but maybe not. It could be interesting to see situations where Jason is thinking too much and Ronnie has to direct him to take quick action. Besides, I got attached to the look of the Jason version of Firestorm (not counting Yellowstorm) and it would be nice to see it show up occasionally. All I can say is, we are so very spoilt by Dan Jurgens on Firestorm! This is his best work since Superman in the 90’s! Charlemagne Method activated! 2 copies purchased! Great issue. Already looking past the Titans issue to get to the Rogues! C’mon sales figures. I hope they begin to look up cuz I wanna see Hyena, Typhoon and of course SlipKnot! @Martin Stein RIP – I agree that Jason should be as much of a focus as Ronnie. In fact, I think it would be cool to alternate narrators every other issue. One issue has Ronnie driving the narrative; the next has Jason. I finally got around to reading FURY OF FIRESTORM issues #15 and #16. I really, reeaallly did not care for #15 at all. It was a Captain Atom issue guest starring Firestorm. I thought Captain Atom’s death was lazily conceived and executed, and it made the characters all seem stupid and irresponsible with their powers instead of heroic. But if issue #15 was a step backward, issue #16 was a step up. So far I think Jurgens has been at his best when writing the day-to-day soap opera-esque parts of Ronnie and Jason’s lives. The football game, the dialogue between the kids and their girlfriend, their parents’ interaction–all of this felt like an extension of the classic Conway/Milgrom Firestorm stories. I’m not sure how I felt about Firestorm’s scene with the General at the end. I guess having Ronnie bumble like a moron was kind of the point, and it creates a new set of problems for him to deal with. I’m excited for the next issue featuring the Teen Titans, if only so that someone other than Scott Lobdell can try writing them. Great issue overall. Other than the blip with issue #15, I continue to be happy with this direction for Firestorm. On a side note: Shag, I’m not sure if you’ve heard about this, but DC is honoring Black History Month at ComiXology with 99-cent sales on some of their titles. One of these weeks–I’m not sure which–will feature a sale on the Jason Rusch Firestorm series that debuted after IDENTITY CRISIS. Hopefully, Firestorm Fan can help promote this sale and generate some sales for older Firestorm digital comics.